Juana Díaz ([ˈxwana ˈði.aθ (european spanish) or xwana ˈði.as(american spanish)]) is a municipality of Puerto Rico located in the southern coast of the island, south of Jayuya, Ciales, Orocovis and Villalba; east of Ponce; and west of Coamo and Santa Isabel and the Caribbean Sea to the south. 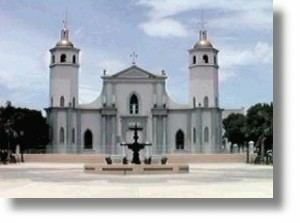 Juana Díaz is spread over 12 wards and Juana Diaz Pueblo (The downtown area and the administrative center of the city). It is part of the Ponce Metropolitan Statistical Area. Juana Diaz is known as "La Ciudad del Mabí" (Mabí City) - Mabí (see Mauby) is a fermented Taíno beverage made out from the bark of the mabi tree Colubrina elliptica (L'Her.) Brongn. Juana Díaz was founded in 1798 by José Izquierdo III. The civil government of this territory was established on April 25, 1798. Note to people unfamiliar with Puerto Rico's political subdivisions: "Juana Díaz" refers here to what is officially called Municipality of Juana Díaz. All wards listed here are what constitute the municipality itself. "Juana Díaz pueblo" (above) is the downtown area and the administrative center of the municipality - although all inhabitants within the municipality are "juanadinos" (name given to people of the Municipality of Juana Díaz). Several rivers run through the Juana Díaz territory, among them, Río Inabón and the Río Jacaguas, from which Juana Díaz takes its nickname: "Ciudad del Jacaguas". The Guayabal dam between Juana Díaz and Villalba is located in this river. Among its main tributaries are Río Toa Vaca in Villalba, also dammed. Both Guayabal and Toa Vaca lakes are visible in the map. 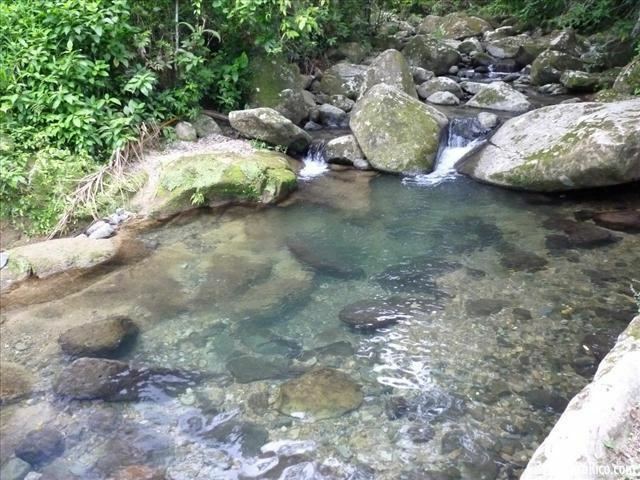 Lake Toa Vaca is also the main source of drinking water for Juana Díaz, Ponce and other towns. Juana Díaz produced sugar cane but with the urban and industrial development the sugar industry has disappeared from Puerto Rico. Local rums are now produced from raw materials imported from other countries. Juana Díaz now produces plantains, bananas, mangoes, and other crops that are consumed in the local markets and also exported to other countries. Cattle and pigs are also raised in local farms. Beige marble—one of the finest marbles in the world. Three Kings Festival - January Página Oficial de los Reyes Magos de Juana Díaz This religious and cultural event began in 1884. It celebrates the visit of the Three Kings (Three Wisemen) to baby Jesus. Every year on January 6 people of all ages come to town to celebrate Three Kings Day. The main event is a parade down Comercio Street to the town's plaza where a big altar is set up for the celebration of the Holy Eucharist. The Eucharist begins with an act of the Prophets announcing the coming of a messiah. The prophesies are followed by the sighting of three kings by the shepherds. The holy mass follows and at the end the Three Kings find and adore baby Jesus. This is a must see activity if you are visiting Puerto Rico in January, and is an activity for all ages. If you can, come dressed as shepherds and be part of the celebration. Good Friday - Juana Díaz celebrates many activities during Holy Week each year. The most notable is the Good Friday procession that transists through many of the urban communities with representations of the Stations of the Cross. Thousands of juanadinos and people from other towns visit Juana Díaz on Good Friday. Patron Saint Festivities of San Ramón Nonato - August; San Ramón Nonato's celebration is August 31. Both religious and cultural events are celebrated at the end of August and early September in honor of San Ramón Nonato, the patron saint. 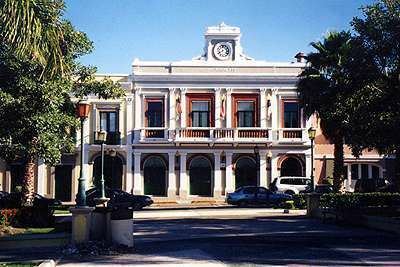 Like all municipalities in Puerto Rico, Juana Díaz is administered by a mayor. The current mayor is Ramón Hernández Torres, from the Popular Democratic Party (PPD). Hernández was elected at the 2000 general election. 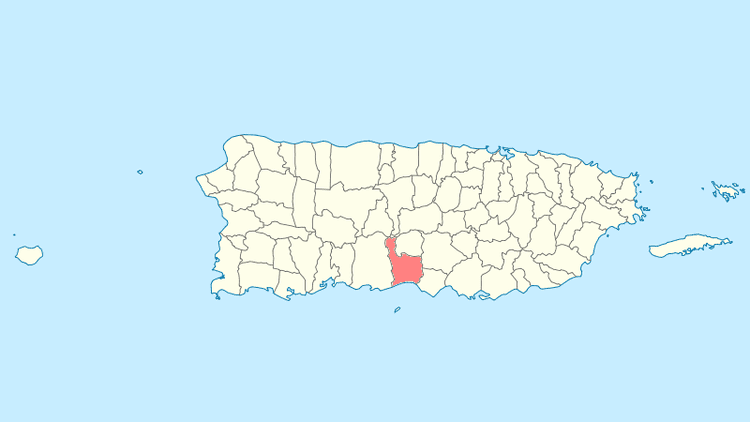 Part of the city belongs to the Puerto Rico Senatorial district V, which is represented by two Senators. In 2012, Ramón Ruiz and Martín Vargas Morales, from the Popular Democratic Party, were elected as District Senators. The other part of the city belongs to the Puerto Rico Senatorial district VI, which has been represented by Miguel Pereira Castillo and Angel M. Rodríguez since 2012. The flag of Juana Díaz is rectangular in shape, formed by two triangles whose hypotenuse extends from the upper left corner to the lower right corner. The upper triangle is white, the symbol of silver and the lower triangle is yellow or gold. At its center is the coat of arms of Juana Díaz in its natural colors. The Nazarene Cross: It is in the center of the coat of arms. It stands out subtly between furrows and space, symbolizing the union of two races by means of the inalienable bond of the Christian faith. The cross also symbolizes the western Christian culture. The woman represents - Mrs. Juana Díaz, the towns namesake - with her hands the woman strews thirteen grains of corn into thirteen furrows, symbolizing the seeds that germinated and were the base for the foundation and growth of our town. The woman dresses as those of her time. The Sun symbolizes a new horizon, hope in the formation of a town. The sun in the coat of arms has thirteen rays, each representing a ward of Juana Díaz. Thirteen knolls stand out in the coat of arms symbolizing each of the thirteen wards or barrios of Juana Díaz. The mountains also symbolize that Juana Díaz has been one of the richest mineral towns in Puerto Rico. The Indians represents the natives who settled the village before the arrival of the white man. The native carries on his back thirteen sheathed arrows and a bow, and an arrow on his head. The bow and arrow represent the only effective means of defense useful for survival. The shackle and the whip represents Juana Díaz as the martyr of '87 because the most heinous, repressive institution known at the time was enforced in our town - "El Componte". It was in Juana Díaz where liberal politicians and dedicated patriots were martyred because they fought against the tyranny imposed by General Romualdo Palacios. Palacios was the most tyrannical and cruel of all the governors of our nation. "El Componte", a military tribunal, was used to quiet the rebel voices of those who loved law and order. The harp represents the music, the quill pen dipped in the ink well represents the verse, the poetry. Juana Díaz has generously given distinguished poets to Puerto Rican literature. Ciudad Del Jacaguas is the name by which Juana Díaz was known in the past. Many people knew Juana Díaz as the city of Jacaguas, but Luis Lloréns Torres dubbed it "La Versalles de Ponce" (Ponce's Versailles). Four Castles Represent that Juana Díaz reached the stature of city. Cities have five castles in their coat of arms, villages have four and smaller towns have three. Among the most important roads in Juana Díaz are the Luis A. Ferré Expressway (PR-52) which connects Juana Díaz with Ponce and the airport in just minutes and San Juan in a little more than one hour. Other important roads include road PR-14 which runs through downtown Juana Díaz on its route between Ponce and Cayey, road PR-149 from Juana Díaz to Manatí running through Villalba and the "Cordillera Central" and road PR-1 which goes from Ponce to San Juan through barrio Pastillo in the south coast of Juana Díaz.